It’s been three weeks since Jace, the Mind Sculptor was unbanned. For the past three weeks, I have struggled with the card; the power is there, but an optimal shell has proven elusive. Judging by the lack of articles around the greater internet, it seems that most brewers are having similar problems. Today, I will run through what has and has not worked for me, and explain where I’m heading with Jace. My testing process is a little odd because almost all my work is done in paper tournaments. I don’t like playing online for a lot of reasons, and it’s very easy to play paper for me. If you want to travel around western Denver, you can play in a 4-5 round Modern tournament every night, three of which are at my LGS, Black Gold. I can brew up a deck with the expected metagame in mind and then get immediate feedback from very good players, and we can all learn from each other’s successes and failures. As someone who has managed testing teams online, I greatly prefer the paper method because it’s easier to get feedback and make adjustments on the fly. In short, everything I do is tournament-tested, but may only apply to my local metagame. Regardless, I hope that my results are useful to either confirm your own results or help you avoid my mistakes. I started the same place I imagine most players started: slotting Jace into an existing deck. Specifically, the Jeskai Tempo shell that’s been everywhere for months. I’d been playing the stock list for months and just threw four Jaces into the list. To the surprise of nobody, it failed to mesh; the creatures didn’t play well with Jace, and there weren’t enough answer cards to protect Jace. It was really good to play Geist of Saint Traft and then Jace to bounce blockers, but that’s quite inefficient compared to Bolting the blocker and Spell Quellering the next one. In fact, I haven’t yet found a combination that really performs. Compared with tempo and control, the creature-heavy builds haven’t actually needed Jace because they tend to just swamp the opponent and burn them out without needing additional gas or an alternate win condition. The builds I’ve tried even sputter in the face of formerly good matchups. Playstyle could be a factor; I do play control decks conservatively, while taking more aggressive lines with the tempo lists. However, none of the other control players I talk to have had better results. They’ve all had the same problems as I and are equally baffled, as Jeskai should be a good home for Jace. Concurrently with my Jeskai exploration, I did the other thing I’m sure everyone has tried and built Miracles. 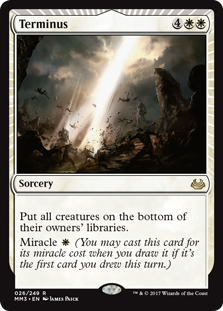 It just seems obvious, as the Miracles spells need to be on top of your library to get value. The best card for making that happen is Brainstorm. Jace is Brainstorm on a stick. My build proved to be so clunky that I ran it exactly once, and was very lucky to not hit an actual aggressive deck that day. By the time you can get Jace online and actually facilitate setting up your miracle cards, it’s late enough for them to not be relevant. Drawing them when you don’t need to, want to, or can’t afford to miracle is a disaster because they just sit in your hand forever. Another player in my area has been trying to make Miracles work in Modern for well over a year now and he took it to the extreme. He was playing Opt, Riverwise Auger, I’m pretty sure See Beyond (memory’s foggy), and a full set of Jaces to ensure that he only hit Terminus when he wanted to, and that didn’t work, either. He still struggled to actually set his top cards, and I picked him apart easily with more traditional control lists. His list was also too full of air to really work against creature decks. It’s not a problem of power level. Terminus is a very good spell, especially at one mana, and Entreat the Angels is a powerful finisher. Putting creatures on the bottom of their owner’s library is a great way to beat the common answers to sweepers like indestructible and regeneration or to get around dredge creatures. The core UW control deck is also great. The problem is that this is Modern, not Legacy. The real power of Legacy Miracles is the expert control it wields over its draw step. Even with Sensei’s Diving Top gone, the deck has Brainstorm, Ponder, and Portent to set its top cards. That kind of effect density just isn’t present in Modern. Without them, the deck will never function as well, if at all. I like Terminus, but I’ve just not seen the evidence that it can be consistently good. UW is another story, and I’ve had great success playing a more conventional UW Control list. This deck has been running very well for the past two weeks. I rarely feel overmatched and have yet to lose the very long games. It almost never runs out of cards, and so grinds admirably. I’m usually down on Field of Ruin because it costs mana to activate, but here it works wonders against Tron or Valakut, the Molten Pinnacle; we’re not doing anything else on turn three, and in control mirrors, it becomes asymmetrical—Grixis and Jeskai lists contain very few basics. My success indicates that the deck is good, but how good remains the question. This deck is very strong against slower decks. I’ve felt, and my winrate supports, that this deck is heavily advantaged against midrange, control, and big mana decks. There are lots of answers for everything, long-term advantage, and tons of mana disruption, all of which make it a nightmare for other midrange and control decks to grind through. I also have fewer dead cards in the mirror without sweepers. The deck’s robust enough to eat many Thoughtseizes and still have relevant spells, which really surprised the Grixis Control players last week. I’ve been crushing the other blue-based control decks, Gx Tron, and midrange-Jund decks that have flooded my LGS since the unbanning. The other advantage is this deck is an excellent Jace deck. It’s very easy to clear out an opponent’s threats and answers so that Jace can land and survive. Once that happens, we have plenty of ways to protect Jace long enough for repeated Brainstorms to lock up the game. There aren’t any truly situational spells, only contextually poor ones like Mana Leak. Jace isn’t a necessary or integral part of the deck, but a very strong payoff card. It’s true that untapping with Jace often seals the game. This deck is slow. Really, really slow. Not just in terms of its win condition, but in terms of actual play speed, and I play fast. Over the past two weeks I’ve gone to time in about 75% of my matches. This is a huge deviation for me; even my previous control decks would finish in a reasonable timeframe. However, the number of decisions this deck makes and the busywork present in the deck are really dragging me down. Some time extenders include Search triggers, planeswalker activations, shuffling, and Celestial Colonnade hits. Then there’s the win condition. I actually had two Searches initially, but traded one for Elspeth because I was struggling to actually win the game. I could establish control easily enough, but actually winning was frequently challenging. There’s just not many options. Obviously, you can attack with Gideon, Snapcaster, and Colonnade, but that’s not always reliable and never quick. Path to Exile and Dismember are quite prevalent. You also can’t always just slam down Jace and win. Plusing Jace on opponents is great, but it’s not always the right play. Brainstorming turn after turn is also great, but doesn’t actually win the game. There’s a surprising amount of tension between the two modes, and knowing when to switch from one to the other is hard. All this combines into a deck that wins the game easily, but takes forever to actually kill the opponent. The other problem is aggro. This version of UW Control really struggles against non-Affinity aggressive decks. Affinity has been fine because we excel at picking off the important payoff cards with counterspells and grinding one-for-one. The only times I’ve lost after untapping with Jace have been to Burn and Goblins. I just couldn’t draw enough counters and didn’t play enough lifegain to actually stabilize, and my slow clock gave them the time to find a win. Goblin Grenade has been devastating. This is a function of my build, which is consciously weaker against swarm and burn decks, and could be easily remedied. Obviously, moving the deck in a more proactive direction would solve the first two problems. However, I don’t know how to do that yet. I’m already playing as fast as I can without punting wildly, and that’s not helping. The deck is too slow and I need to speed it up. However, all my attempts to build a more proactive and creature-heavy list have fallen into the previously mentioned Jeskai trap and clunked themselves to death. A lot more work needs to be done before I will take a proactive Jace list to a paper tournament. As for the second one, the solution is obvious, but I’m not certain of the benefit. My maindeck has a huge advantage in my current metagame, and changing things to solve the poor aggro matchups doesn’t seem worthwhile. Any change I make will make the deck worse in control mirrors and against Tron. This may be acceptable as Eldrazi, particularly as RG Eldrazi gains steam, in which case I’ll cut the Spell Snares for Blessed Alliance. And it may be the correct configuration for the wider metagame, but given how exhausting it can be to play this deck in weekly tournaments, I’d rather not take it to a GP or Open. If you really want a slow control deck and your metagame is as slow as mine, then this is a great Jace deck. However, I think there’s plenty of work to be done before it becomes a great deck in the overall metagame. It bears repeating: brewing with Jace is hard. The payoff is real, and in a slower metagame, this is where I want to be. However, I don’t think this is correct for the wider metagame. I’m still working on the problem and will be trying out different versions in hopes of solving my time problem. I could also be worried over nothing if the metagame is slow enough to make that this is the correct deck. Next week, I’ll look over the results from SCG Dallas for some guidance. Hmm, does Jace open the door for something like Monastery Mentor in a U/W shell? Perhaps the deck could afford to shave a card or two to squeeze him in. With all the love Young Pyromancer is getting, could MM do something for U/W? Just a thought. It’s a possibility. Certainly the closest I came to losing against Miracles was his fast Mentor draws. I haven’t tested it at all, however. I am wondering the same about Monastery Mentor and am tinkering with a build using it. Although I think that it might require a bit of air to make it effective, i.e. some number of Opt’s. If you need a way to close the game faster, play Geist in the board. Mentor seems really bad with the uptick of bolt, especially considering that decks will keep it in against Jace (and you) and with few proactive cards mentor will often only be a 2/2 attacker (it needs red or black). At this is what I believe. Unfortunately Red and Black already have their value token producer in Young Peezy. I have been suffering from the same dilemma as you with my U/W build, slow to close out games. Trying out a single Entreat this week as I am still hunting down 2 Mentors. Has anyone tried putting Jace with Liliana? Seems like the 2 best planeswalkers belong together. Perhaps something like this? I’d be interested in your thoughts if you had time. I haven’t personally tested anything, but the BUG lists I’ve seen haven’t worked. A lot of players have tried them at my LGS and none have done well. I’m not sure why they don’t work, but they just play out clunkier than Grixis or UWx.